Puzzle action game set in the frozen world of the north pole, with fairies, gems and ghosts. You are a fairy who just found out about some hidden relics in the frozen world of the North Pole. You venture there and start searching for the relics. But the forgotten world is haunted by ghosts and filled with deadly traps. Can you recover all the treasure ?! 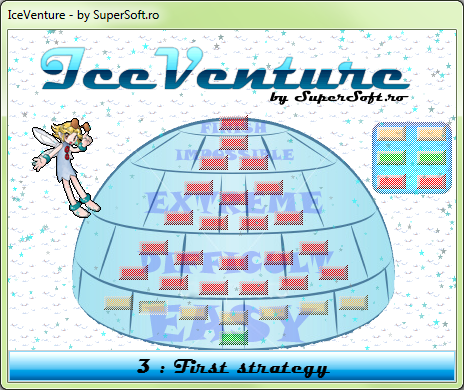 This game features four difficulties, and a last level, totally 30 levels of action and puzzle. Also most levels can be finished in various ways, it is up to you to choose how do you want it.